Around the world Christians are preparing to celebrate Christmas. While for many people the event is one of happiness and an opportunity for strengthening family bonds, for others it’s a time of sadness and loneliness, with the modern-day neologism of phubbing (snubbing someone in favour of a mobile phone) often to blame. 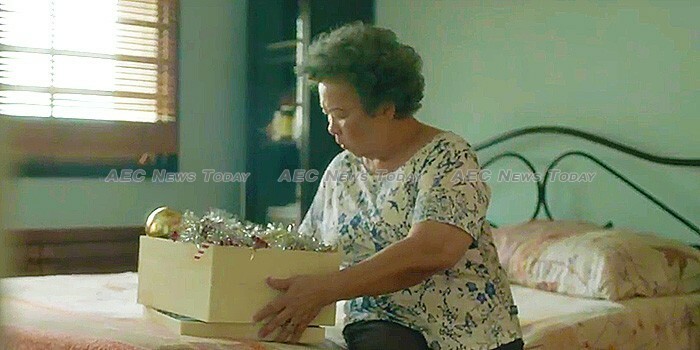 In an attempt to shake Singaporeans from their mobile phone addictions and to focus on the important things in life at this time of the year, Singaporean telco Singtel has produced a 3.48-minute long social-commentary video titled Ah Ma’s Christmas (grand mother’s Christmas). To be screened on Singtel TV and social media channels until December 30, Ah Ma’s Christmas focuses on the isolation and sadness felt by one Ah Ma, despite being surrounded by her family as she prepares for the festive date. After finding no family members with time to help her put up the Christmas decorations, the isolationism is highlighted even further when the Ah Ma finds the Christmas present from her son from the year before… a new smartphone, that has never been removed from its box. Finding no one with the time to teach her how to use it, the Ah Ma seeks help from a friend and is quickly enthralled and delighted by the ability to take photos and videos. The emptiness and loneliness being experienced by the Ah Ma only becomes known to her family when she accidentally sends a video she made on Christmas Eve documenting her sadness to her grandson. With a tag line of ‘lets reconnect this Christmas’, Ah Ma’s Christmas ends with the family happily enjoying their Christmas dinner together… with their phones turned face down, except for when the obligatory selfie is being taken by the newly technology aware Ah Ma. According to Lian Pek, Singtel’s vice president of group strategic communications and brand, Ah Ma’s Christmas is a simple tale that warns against the regrettable phone habit of phubbing. In today’s hyper-connected world, it’s easy to lose sight of the most important things in front of us. “We may be all about connectivity as a company, but we also value connectivity in the deeper sense of the word. We’d love to see people dropping phubbing in favour of better relationships”, she said. Contact details for Samaritans of Singapore (SOS) were added. An earlier version of this story incorrectly identified the gender of Lian Pek and was corrected and previously noted.